When we read the biblical record, no other section in the entire Bible covers as much time and as many events as Genesis 1-5. As we come into Genesis 6-9, we arrive in the section that deals with the world-wide flood that God brought upon this world in the days of Noah. Remarkably, the three chapters will cover a period of time encompassing a period of time less than 18 months (377 days for chapters 6-9). One of the main purposes for Moses writing Genesis was to equip the Israelite nation with a biblical worldview of the God of Abraham, Isaac and Jacob. They had to be deprogrammed from the Egyptian worldview to which they had been exposed to for 430 years, and prepare for the Canaanite worldview they would be facing in the Conquest of Joshua. In today's blog, we want to explore some commonly asked questions about the flood, the ark and the reliability of the Genesis record. Hopefully the reader will see that the Bible is not only accurate and reliable in matters of faith and practice, but also in terms of its testimony about history, science and life. 1. Was The Ark large enough to hold all of earth's species? 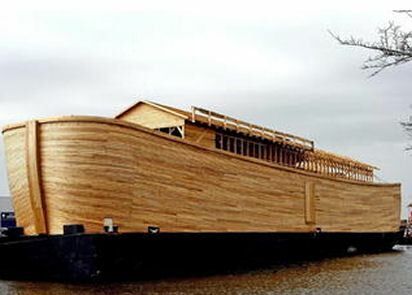 According to the Biblical record, when we take modern day measurements into consideration, the Ark was a vessel 450 ft long, 75 feet wide and 45 feet high. It had an opening up top, near its roof measuring 18 inches. The vessel had 3 decks with a total deck space of over 101,000 square feet or to a holding capacity of 522 railway cars. One must realize that the Bible regards animals according to “kinds”, which would equate to our reckoning of animals by the modern biological term "genus". This would lower the amount of specimens on the ark to a total of 16,000 animals. If we calculate Noah and his sons taking shifts to oversee the entrance of the animals into the ark, we average the rate out to 2 animals entering per second. With many of the animals averaging the size of a sheep, this all could had been accomplished in the prescribed 7 day period of 7:4,10. The Ark could had handled up to “35,000” kinds of animals. With our estimate of 16,000 loaded on the ark, half the space would had remained for Noah and his family. 2. Is there any historical evidence outside the Bible for the existence of the Ark? a. In 400 b.c. Abydenos, the historian and Berosus, the Babylonian High Priest, state that the ark was atop a mountain in Armenia. b. Josephus, a Jewish Historian writing in 100 A.D, speaks of the Ark being accessible on a mountain in Armenia. c. Marco Polo, an explorer in 1300 A.D, speaks of the Ark on the summit of Mount Ararat. e. Ed davis, a WWII veteran, reported in 1943 having seen the ark after having been led to the site by a Kurdish resident. f. George Greene, a worker for the American Oil Company, reported seeing the Ark perched on a steep ledge while flying overhead in a helicopter in 1952. All of these reports speak of a large vessel, located in the same location, Mount Ararat. All these people are from different cultures, times and places. How could such a large ship be located some 17,000 feet upon a large mountain unless the worldwide flood placed it there! 3. Wasn't the flood just an isolated event experienced by a few people, or was it truly a world-wide event? Native global flood stories are documented as history or legend in almost every region on earth. Old world missionaries reported their amazement at finding remote tribes already possessing legends with tremendous similarities to the Bible’s accounts of the worldwide flood. H.S. Bellamy in "Moons, Myths and Men" estimates that altogether there are over 500 Flood legends worldwide. Ancient civilizations such as (China, Babylonia, Wales, Russia, India, America, Hawaii, Scandinavia, Sumatra, Peru, and Polynesia) all have their own versions of a giant flood. These flood tales are frequently linked by common elements that parallel the Biblical account including the warning of the coming flood, the construction of a boat in advance, the storage of animals, the inclusion of family, and the release of birds to determine if the water level had subsided. The overwhelming consistency among flood legends found in distant parts of the globe indicates they were derived, more or less, from the same origin - the original account as we see in the Bible. The Israelites would had been exposed to Egyptian and Canannite flood stories. Undoubtedly the one given in Genesis is unique, in that it was given by Divine Revelation, whereas all the others were just mere retellings by men. In tomorrow's blog we will consider why the flood account is crucial to the Christian faith. [i] Dr. James T. Hall. The Origin of Life. 1989.